Can You Really Lose Fat and Build Muscle at the Same Time? If you’ve spent any time searching the web for info on how to lose fat and build muscle at the same time, also known as body recomposition, you have probably come across conflicting information. There are basically two schools of thought on this topic. There are those that think it’s impossible to lose fat and build muscle at the same time and those that believe both goals are possible. What Do the Critics of Body Recomposition Say? First, it may help to understand why some people believe this task is unachievable. A lot of the skepticism surrounding body recomposition revolves around the first law of thermodynamics. This law states that energy can be transformed or transferred, but it cannot be created or destroyed. Skeptics believe that in order to gain muscle, you must have a surplus of energy and that you must have a deficit of energy to lose fat. And, that you can’t do both at the same time. You do need to store energy to build muscle, which means you need a surplus. You also need to burn energy to lose fat, which means that you need a deficit of energy. So, the skeptics are right on that point. But, they are wrong to believe that you can’t achieve both at the same time. Protein and fat are handled completely differently. Your body actually directs calories where they are needed, independent of the source. So, you can direct calories to your muscles and to your fat mass separately. This is referred to as nutrient partitioning – or calorie portioning. Can you really lose fat and build muscle at the same time? The simple answer is yes. But, achieving this is not always easy. By paying attention to when you eat and your balance of the three primary nutrients (carbs, fats, and protein), you can maximize your ability to partition nutrients. You don’t need to eat at a calorie deficit to lose fat. But, you do need to pay attention to how much food you eat and the balance of carbs, fats, and protein. You should continue eating your body weight in protein and fill about 25 to 30 percent of your calories with fat. The rest of your calories will come from carbs, and here is where you can maximize your calorie partitioning. The majority of your carbs should be consumed before your most intense strength training workout of the day. The carbs help support testosterone levels and give you the energy that you need for your workout. You will be using a large portion of these carbs for energy and storing less fat. The protein that you eat throughout the day will help with muscle tissue repair, allowing you to develop more muscle. By shifting the balance of carbs, fats, and protein so that the majority of your carbs are used during your workout, you will still be able to lose weight without restricting your calories, which would end up limiting your ability to gain muscle. You’re almost ready to start losing fat and building muscle at the same time. But, there is one more step. You also need to increase your strength training. Get more out of your strength training workouts by using a double progression model. If you’re not familiar with this concept, it’s easy to follow. Double progression simply means that you are increasing two separate variables of your workout at the same time, instead of just one. For example, any time that you increase the number of repetitions that you perform, you are progressing your work. With double progression, you increase two areas of your workout. In this case, we’ll increase reps and weight. You can still use your existing workout with this method. Let’s say that you normally perform four sets of 6 repetitions while performing bicep curls using a 30-pound dumbbell. 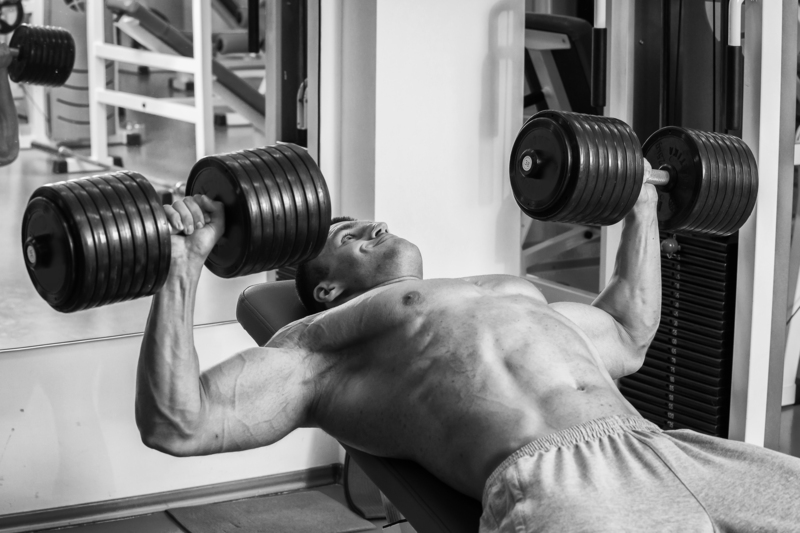 With double progression, you would perform a set of 6 reps, increase your weight, and perform your next set. During the third set, you would increase to 8 repetitions. During a single training session, you are increasing two variables to maximize your workout, without adding a lot of immediate strain. This will increase your ability to gain muscle, without requiring you to develop an entirely new workout. What Else Should You Know About Body Recomposition? You need to keep in mind that a lot of the theories surrounding body recomposition have not been fully explored. Not everyone is able to achieve the same results. You shouldn’t get too frustrated if you do not notice faster results. After several weeks, if you are still not getting results, then it may be time for a different approach. You should continue following the nutrient partitioning recommendations discussed while making a few changes to your workout. Choose one area of your body that has been giving you trouble and focus solely on that muscle group while sticking to maintenance work for other areas of your body. For example, if you think that your thighs are too fat, but your arms are fine, then focus on leg exercises. Include more leg presses, leg extensions, and barbell squats in your routine. Remain focused on this one area until you start noticing the fat come off. As a final suggestion, you should not get too worked up over trying to lose fat and build muscle at the same time. The concept sounds great, but it can be difficult to achieve. This is why most people tend to focus on one goal at a time. When you gain muscle and eat a balanced diet, you should naturally begin lowering your total body fat percentage. But, sometimes the fat loss does not come quick enough. If you’re really worried about fat loss while building muscle, then remember the nutrient partitioning tips. Fill up on carbs before your workout and protein after your workout. Good luck and remember to share your results. The post Can You Really Lose Fat and Build Muscle at the Same Time? appeared first on .